Powers/Abilities: Skilled acrobat, knowledgeable in jungle survival. 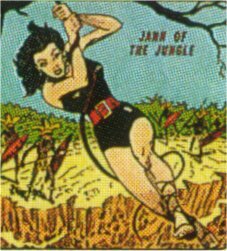 History: (Jungle Tales #1-7, Jann of the Jungle #8-17, ga) Jane Hastings was a former circus trapeze artist and animal trainer, who travelled to the Congo to work on a movie as a stunt double. There she met Kuba, leader of the local natives, who recognised her as the granddaughter of Jann, a young woman who had once lived there many years before, and who had become beloved of the locals for helping them in times of need. Jane admitted that her grandmother had told her of this, and had taught both her mother and herself all about the jungle. She was surprised however to find the natives remembered Jann, and to find that she herself felt strangely at home there. Soon after Jane had to save the movie people from danger, and decided to remain in the jungle and make it her home, taking the name her grandmother had been known by for her own. (What If...? I #9) Jann helped Marvel Boy locate the Gorilla Man, who was needed to help FBI agent Jimmy Woo fight a plot of the Yellow Claw's. Comments: While the Avengers Forever mini-series has wiped out the timeline of the 1950's Avengers seen in What If? I #9, it's been acknowledged by writer Kurt Busiek that a similar group probably formed, just not using that name...and if they formed, then it probably means Jann still helped Marvel Boy recruit Gorilla Man.